kcmetromoms.com: Lady Gaga's Born This Way Foundation Mental Health Awareness Event in KC! Join Lady Gaga's Born This Way Foundation for a discussion about how parents and other caring adults can help support our young people's mental health and learn about resources available in your community. 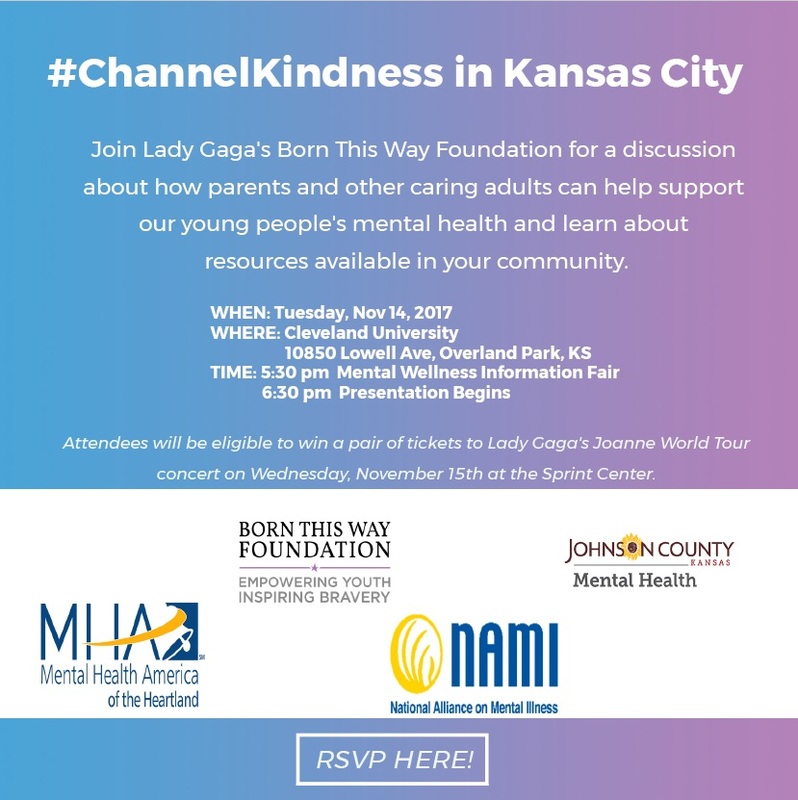 Lady Gaga’s Born This Way Foundation, NAMI of Johnson County, Mental Health America of the Heartland, and Johnson County Mental Health will co-host a discussion focused on how parents and other caring adults can help support our young people's mental wellness. The event will highlight the findings of Born This Way Foundation’s recently released survey, Kind Communities: A Bridge to Youth Mental Wellness, followed by a parent testimonial by Dr. Arkin, a panel discussion and Q + A. Attendees will also have the opportunity to learn more about local mental wellness resources in their community and will be eligible to win a pair of tickets to Lady Gaga's Joanne World Tour concert on Wednesday, November 15th at the Sprint Center.